Yesterday we began hearing about a new threat to the Apple mobile operating system called Masque Attack. Security company FireEye first identified this new threat to the Apple iOS. Essentially, this malware substitutes a malicious app for a genuine app on your iPhone or iPad. This bad app can then gather and send sensitive information such as login or password information to the attacker. There is little chance you’ll be affected, but here’s a summary of what you need to know. The infection process begins when an iOS device user downloads and installs an app that did not originate from the official Apple App Store. So to protect yourself from this threat, only install apps through the App Store. Don’t install any apps from a web page pop-up or text message. Be suspicious of links that offer to install apps or app updates if those links don’t take you to the Apple App Store. You can check links on your computer by hovering over the link with the mouse pointer and looking for the destination in the status bar of your browser. Look in lower left corner of the browser window while pointing at the link. You’ll see the URL (web address) of the link destination. 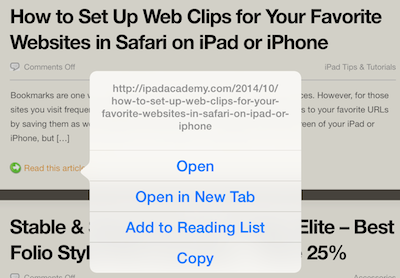 On your iPad or iPhone, touch and hold on the link to reveal a window where you’ll find the destination of the URL. From there you can choose to open the link or cancel the jump to the URL if you have doubts. If you have doubts, tap anywhere outside the pop-up window to close it. Here’s a sample article link from my iPad Academy website.